Walk into the supermarket just now and you will see piles of large, round, yellow "softballs" stacked in pallets or on display at the end of the citrus aisle. 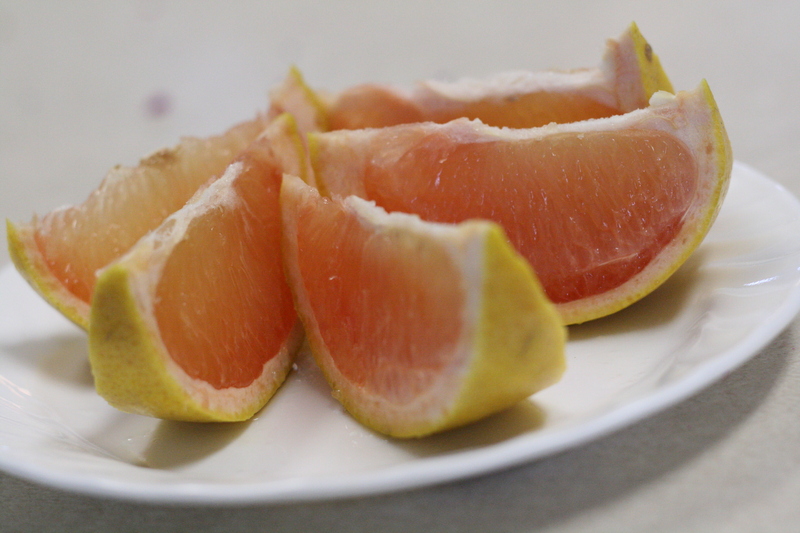 Grapefruit -- one of the quintessential winter fruits. I distinctly remember my mother getting up morning after morning to cut grapefruit, carefully winding her knife around each little section, so we could sit down to breakfast with half a grapefruit each. I also remember the day we watched a guest take a whole grapefruit and carefully peel the skin away to reveal a beautiful, pink ball that could be plucked apart and eaten like a peeled orange. It opened a whole new realm of grapefruit eating for us. Don't just get stuck in a rut though. Think outside the morning breakfast bowl. Think salads, desserts, juice, and cake. I've sectioned grapefruit and added it to spinach salad instead of an apple or mandarin oranges. Squeeze the leftover juice to replace lemon juice in the salad dressing. Recipes for grapefruit cake can be found, and of course one can always squeeze the fruits to make juice. For a delicious and healthy dessert, why not try this salad? Use a sharp knife to top and tail the pineapple, then stand it upright on a chopping board. With the sharp knife, carve the skin away and discard. Rest the pineapple on its side, then cut into wafer-thin slices. 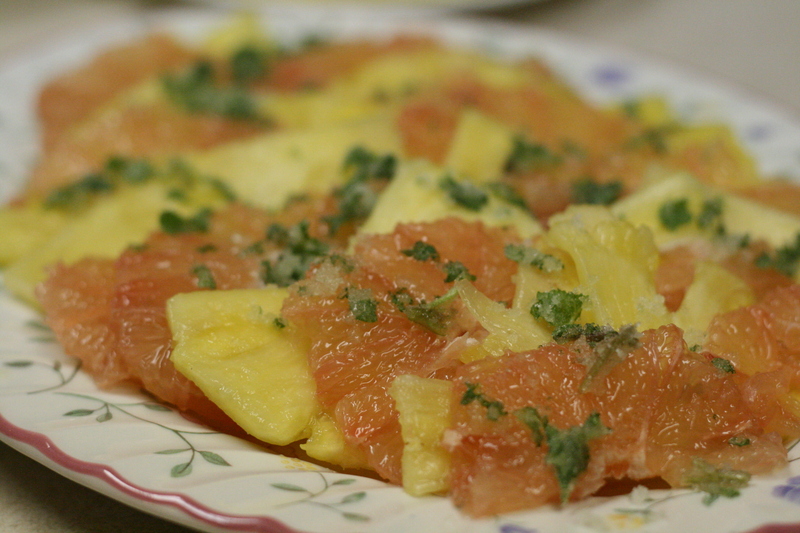 Repeat with the grapefruit, cutting away the peel and pith, then cut into slices. Arrange the fruit on a serving platter, catching any juices, and set aside. Using a pestle and mortar, pound the sugar and mint together until completely blended. Scatter the mint sugar over the fruit and serve on its own or with yogurt (preferable Greek yogurt). NOTE: I loved this salad. I'm also eager to try substituting lime zest for the mint and also trying it sometime with shards of crystalized ginger over top, or even a little fresh ginger grated into the sugar. I just bought grapefruit yesterday. Thanks for the ideas! We tried the salad tonight with the lime zest (since I had no mint), and I loved the combination. Have you considered having a "printable view" for each recipe? Thanks for all the work you put into this! Good ideas! I love grapefruit, too, but there's an easier way to eat it. Cut in half, use kitchen shears to cut out the core and a grapefruit spoon to dig out the juicy fruit. It's way easier than cutting around the edge with a grapefruit knife and not as messy as eating pieces. You can even drink the remaining juice out of your grapefruit "cup" after you've eaten the sections! awesome posting more on health pls!! !